Biomedical researchers have created a novel way of overcoming one of the biggest hurdles to the regeneration of human tissue in a lab by using spinach leaves to build working heart tissue. The demand for organs and tissues for transplantation far exceeds availability. In the US, 22 people die each day while waiting for an organ or tissue to become available. To address the shortage, scientists have been working on growing various tissues and whole organs in the lab. The difficulty of establishing a vascular system which can deliver blood deep into developing tissue is one of the major stumbling blocks preventing scientists from growing new human tissue and organs in a laboratory. Current methods have been unsuccessful in building the branching network of blood vessels essential for delivering the oxygen, nutrients, and molecules required for healthy tissue growth. 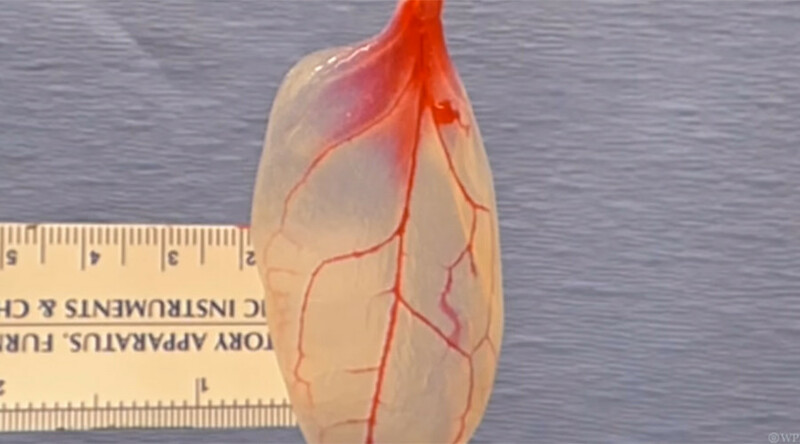 However, a team of scientists from Worcester Polytechnic Institute (WPI), in Massachusetts, has managed to convert a spinach leaf into living heart tissue, taking advantage of the network of veins that already exist in the plant naturally and using them to transport blood. “Plants and animals exploit fundamentally different approaches to transporting fluids, chemicals, and macromolecules, yet there are surprising similarities in their vascular network structures,” the introduction to the scientific paper reads. The researchers bought spinach in a local market and stripped the leaves of its green plant material, leaving only the fine cellulose structure that holds the leaf together. In a series of experiments, they successfully grew beating human heart cells on the leaves. The study, which will be published in the May edition of the journal Biomaterials, opens the door to potentially using multiple spinach leaves to grow layers of healthy heart muscle to treat heart attack patients. “It’s working in many other plants,” he added. In addition to spinach leaves, the team successfully removed cells from parsley, sweet wormwood and peanut hairy roots. They expect the technique will work with many plant species that could be adapted for tissue regeneration studies. "The spinach leaf might be better suited for a highly vascularized tissue, like cardiac tissue… Conversely, the vascular columns of wood might be useful in bone engineering due to their relative strength and geometries," the study notes.